Some of the most amazing places on the Big Island are very difficult to reach over land. Using a helicopter makes it possible to see many of these wonders in a very short amount of time. Helicopter tours depart from Kona, Hilo, and Waikoloa and can last between 1 hour and a full day. From where do the helicopter tours depart? Tours from Hilo vs. tours from Kona. Why are Kona tours more expensive? What happens on a Helicopter Tour? 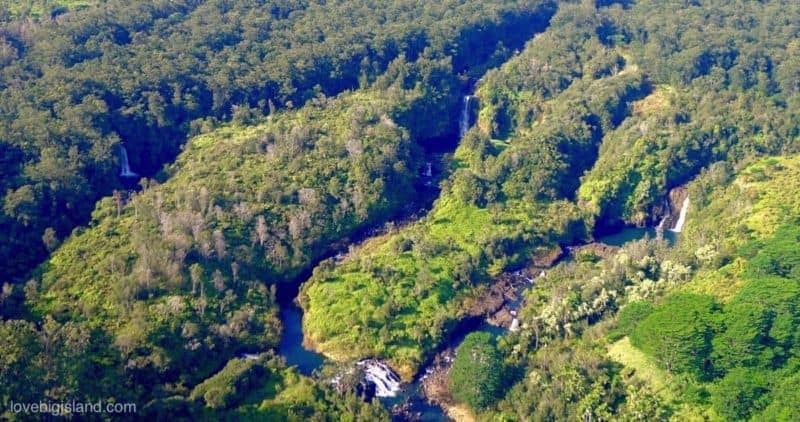 Taking a helicopter tour early during your stay can help you set your priorities for the rest of your stay on the Big Island. Helicopter tours are not cheap as prices start at about $150/hour. We consider them one of the unforgettable experiences on the Big Island despite their price. If your budget allows it we highly recommend taking one. 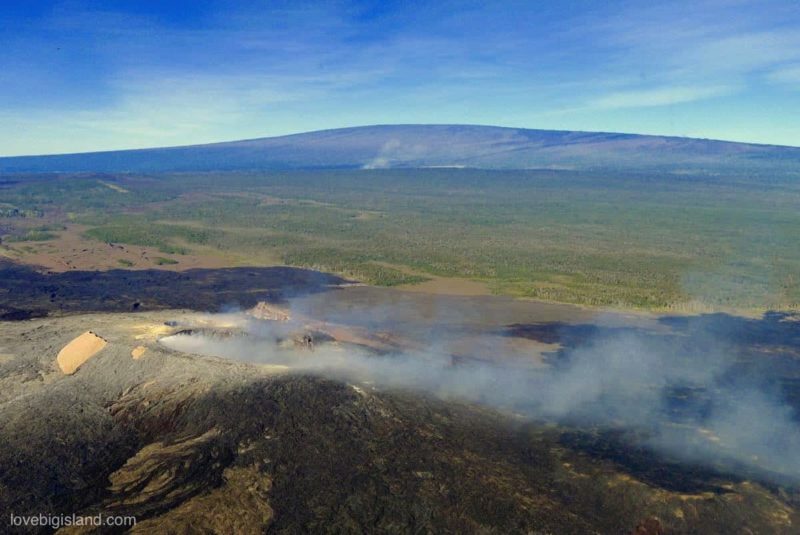 The lava and volcanoes helicopter tours are best suited for people that mostly want to see the lava. 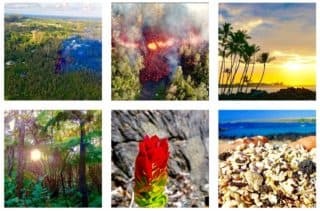 These tours tend to be the shortest and most affordable when they depart from Hilo because the active part of the Kilauea volcano is closest to Hilo airport. Typically you will make a 40 to 50 minute flight going southwest from the Hilo airport to lower Puna where the 2018 LERZ eruption took place and a few other vents of the Kilauea volcano, then northeast to the waterfalls and jungle at the Hamakua coast, and then back to the airport. Helicopter tours can get you very close to the action. Here you see the two open craters of the Kilauea Volcano (Puʻu ʻŌʻō in the foreground and Halemaʻumaʻu in the background). 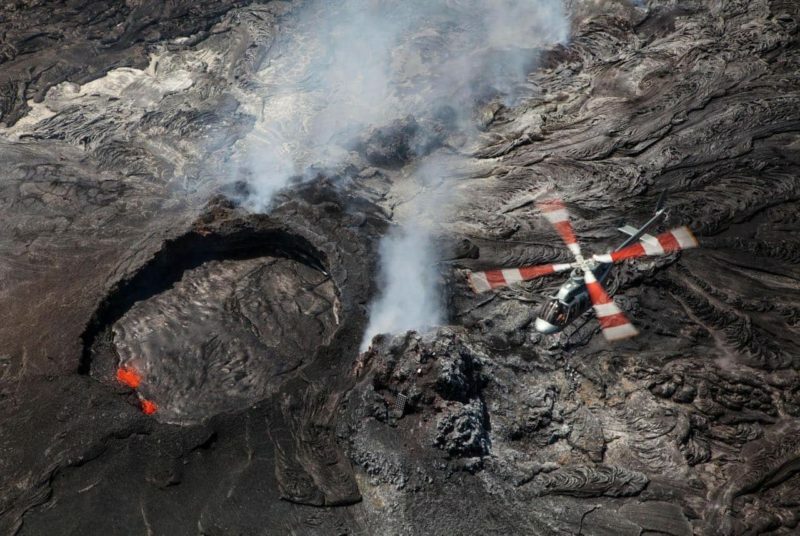 Most helicopters will fly almost directly over the lava in the cone! The best places to see waterfalls and dramatic cliffs on the Big Island are on the north (Kohala) and east (Hilo + Hamakua) side of the island. The Kohala coast with the Waipi’o valley 2000+ ft cliffs and waterfalls will hands-down be the best part of this ride. Many waterfalls on the slopes of Mauna Kea are impossible to reach by road. Hopping in a helicopter (or a small plane) is the only way to see them. These falls, for example, are just a few miles away from Hilo. A circle island helicopter tour combines all of the above, sometimes with a bit more. These tours can take the whole day, with at most ~2 hours of flight time. The rest of the time is used for on-ground sightseeing at locations that differ per tour. If you do decide to go for one of the circle island tours, try to make sure that you will fly over the west (Kona) coast to see the spectacular sunset. You can directly compare the prices for the tours offered by Blue Hawaiian Helicopter Tours, Paradise Helicopters, and Sunset Helicopters by clicking on either the banner below or on this URL. This will take you to the ‘hawaiiactivities’ website, which is useful to compare helicopter tours and to find occasional discounts1. Paradise Helicopters flies from the Hilo airport, the Kona airport, and the Waimea / Kohala airport. They may provide free round-trip transportation to and from the Kona International Airport, but make sure to check the conditions on their website. Blue Hawaiian helicopters depart both from the Hilo airport and from the Waikoloa Heliport, 4 miles SW of Waikoloa Village. Safari Helicopters have their home base in Hilo, at the Hilo airport helipad. Sunshine Helicopters flies from the Hapuna Heliport, located 30 minutes (27 miles) north of the Kona airport east of the Hapuna Golf Course. Helicopter tours on the Big Island take off from one of these five heliports. Image adapted from google maps. Helicopter Tours from Kona or from Hilo? Helicopter tours depart from 4 places: the Hilo airport, the Kona airport, and the Hapuna and Waikoloa heliports (both close to the resorts). The price difference for tours leaving from these locations can be significant. Kona tours cost sometimes almost twice as much as the Hilo tours. There is a good reason for this: your time in the air (see next paragraph). Depending on what you want from the tour you might even be better off choosing the more expensive Kona option. It makes sense that tours from Hilo are cheaper because your departure heliport is closer to the active lava and flight times are shorter. After all, tour prices are set mostly by the amount of time that is spent in the air. Tours from Hilo often involve a quick return trip to the lava, with perhaps a visit to several of the nearby waterfalls. Tours from Kona need to cover more distance to get to the active lava. Because of this, they often include a visit to the lava into a ‘circle island’ tour. This means you may get the see the impressive 2000 ft waterfalls at the Kohala coast that are almost impossible to see without an aerial tour. You will also fly over the tropical and lush Hamakua coast, and get to see south Kona with famous sites such as the place of refuge. Summarizing, if you are looking to see just the lava, you should try booking your tour from Hilo. If you have the resources to splurge and the desire to see more of the Big Island from the air, a circle island tour is highly recommended! What to expect on a Helicopter Ride? What is the added value of a Helicopter tour? Q1: What to expect on a helicopter ride? When you book your tour you will be asked about any seating preferences you may have and to provide the weights and heights of all people in your group. This is a safety feature meant to make sure that the helicopter is balanced and the weights you provide will be checked again at check-in. Make sure to provide as accurate numbers as possible to avoid any delays that may arise from having to re-balance (or re-schedule!) the helicopter. You will also receive a confirmation email with valuable information on what your are (and are not!) allowed to bring in the helicopter. Make sure to read this email properly and to share the information with the other people in your group to avoid unpleasant surprised. Check-in for the helicopter tour is usually about an hour before take-off. During check-in your information will be verified and you will be given a safety briefing. During this briefing you receive instructions on how to approach the helicopter safely, how to behave while inside of the helicopter, and where your place in the helicopter will be. Once you make it into the helicopter and are strapped in you put on your headset. These consist of high-quality headphones and an internal communication system that you can use to talk to the pilot and the other people in the helicopter. Usually the pilot will start by introducing himself and talk everyone through what today’s tour will be all about. This is the best time to talk about any special requests you may have. The real fun starts when the helicopter takes off! You quickly see the land below you get smaller and start having a really good overview of the land. Try seeing where you left your car and orientate yourself to see where you’ll be going. Make sure to have your camera ready but to also take in everything through your eyes (not your lens!). See our two tips for making better photos on a doors-on helicopter tour below for how to get most out of your pictures. A helicopter waits to take off from Hilo Airport. On the background you can see the Mauna Kea volcano with 3 of the large (white) telescopes on the summit. After the tour you will return to the spot you took off from. This is the time to take one last helicopter-selfie if you want to, and to say goodbye to the pilot and the ground staff that helps you disembark. Tips are appreciated if you did appreciate the tour and think the pilot did a stellar job. We have made a checklist to go through if you have never been on a helicopter tour before. You can use this checklist for example when deciding between different tours. Do not hesitate to contact each tour operator before booking, because a little preparation really can make a big difference. Bring a polarizing filter for your camera if you have one. Reflections of light clothes will reflect back from the windows into your camera and these are some pictures that you don’t want to be in yourself. Q3: What is the added value of a Helicopter tour? Flying over the Big Island in a helicopter lets you see the land in a way that few people ever will. A helicopter tour can help you pick your favorite destinations and help decide how to arrange the rest of your stay. Think for example about the hidden waterfalls falling over the 2000-feet high cliffs of Waimanu valley and Waipi’o valley. These sights are very difficult to see from the ground, but perfect to explore from a helicopter. Taking a helicopter tour is also the only way to get an (almost) guaranteed look at the lava. The Kilauea volcano can be unpredictable and easily visible lava flows have been common the last few decades. However, there is no guarantee that this will be the case during your visit. Helicopters can fly over the Kilauea craters, allowing you to see straight into the fiery action. If you also want to try your luck at hiking to the lava flow, have a look at our red-hot lava viewing guide. This is technically not a question, but seeing a video shot during a helicopter tour is one of the best ways to prepare yourself for one. This video by youtube user bship5225 shows footage shot during a “doors off” helicopter tour over the Kilauea volcano, as well as a few waterfalls.